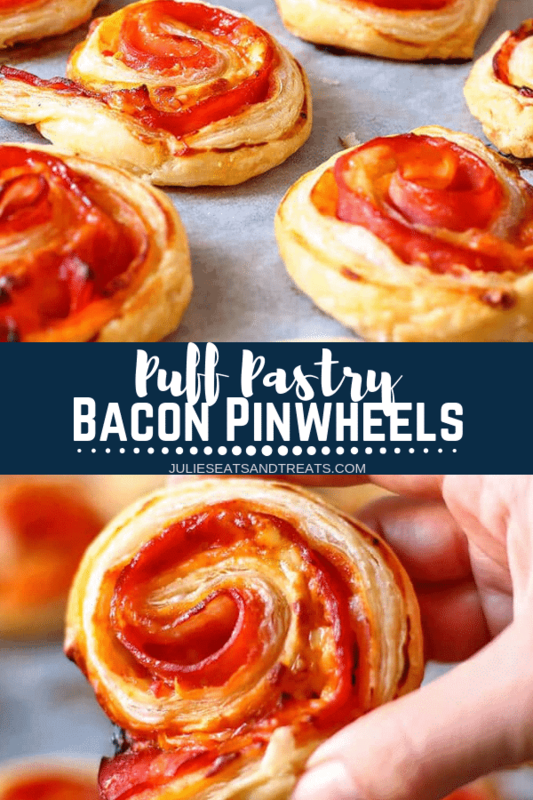 Puff Pastry Appetizers – Easy and fast, Bacon and Cheddar Puff Pastry Pinwheels are fast and easy to make! 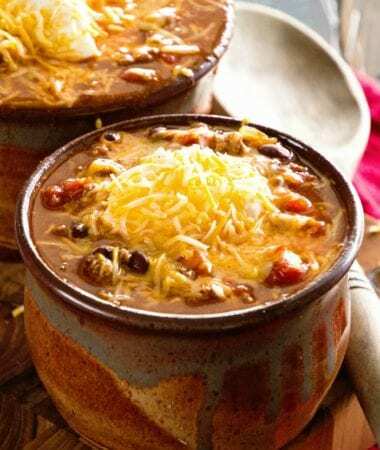 So tasty they are perfect for parties and family gatherings! Hands up who loves bacon! How many of you are there? I am guessing a lot! 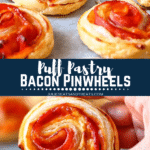 Well, I hope so because I made for you these bacon puff pastry pinwheels! If you are looking for puff pastry appetizer recipes then this is it! 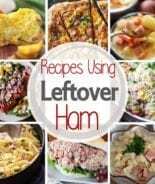 Guys, this seriously is a great recipe! Do you like to entertain at home? 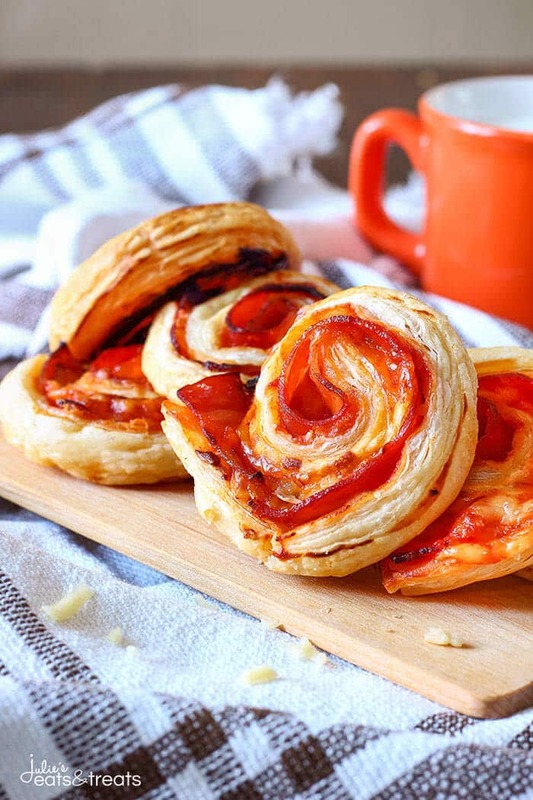 These puff pastry snacks are perfect for it! 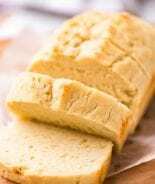 They are delicious and require only a few ingredients. 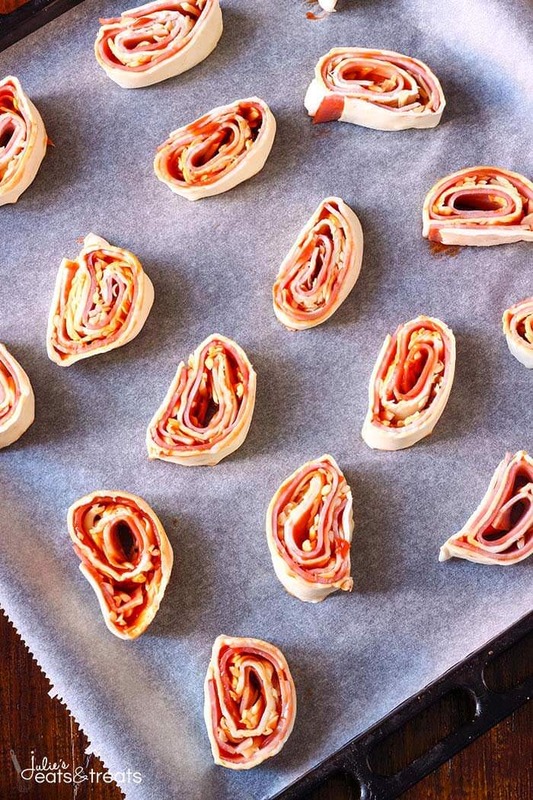 These puff pastry pinwheels bacon bites are also great as an after-school snack. Mind you, you can make them any time and they will go down pretty fast so you might need to double the portion! But this is entirely up to you. I used one ready rolled puff pastry sheet and got 16 pieces out of it which is a pretty good number and definitely should feed a few people. We had this instead of our dinner and to be honest we were starving so you can only imagine that these were gone within minutes. Because, first there is bacon in them so they MUST taste yummy! 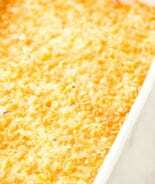 Second, if you throw in a few more simple yet delicious ingredients you just make it taste even yummier. So yes, it took us literally about 5 minutes to finish them and there were hardly any crumbs left. And I tell you something, I love appetizers but puff pastry appetizers are quite new to me. Not to my taste buds though because you know I love these Cheddar and Ham Quiche Cups or these Lemon Cream Turnovers are so tasty for a super easy breakfast! or how about Cinnamon Twists? Those are so sweet and perfect for brunch or adding a sweet treat to your breakfast. 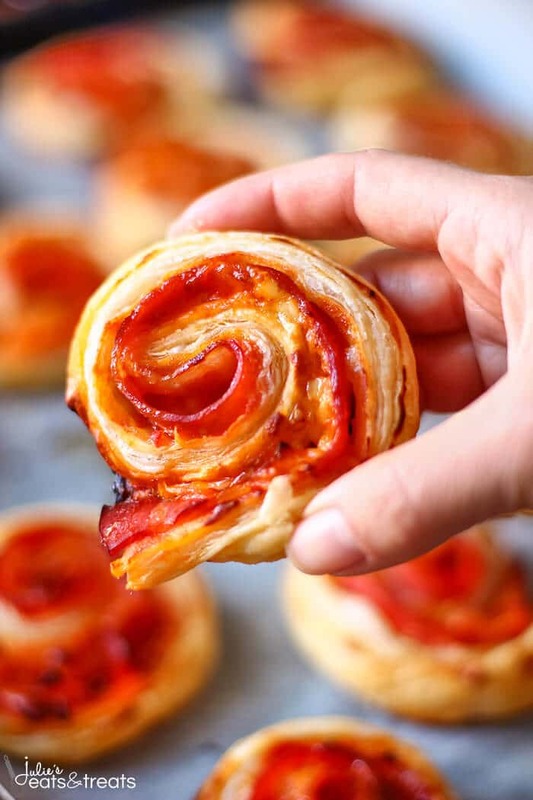 Now are you wondering how these puff pastry bacon pinwheels are made? The prep takes less than 5 minutes. I literally timed myself and was done in four minutes. Guys! 4 minutes is a pretty good time for prep, isn’t it? Puff pastry sheet + ketchup + bacon + cheddar + sweet chili sauce rolled like a Swiss roll & sliced. And that’s about it. 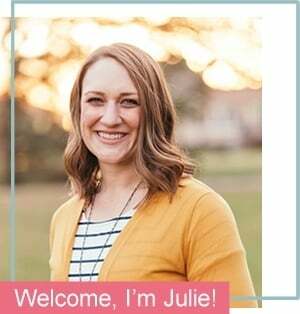 A 5-minute preparation + 20 minutes passive time that you can spend with your kids! Isn’t it great? Watch below to see how easy it is to make this puff pastry appetizer! Is puff pastry and phyllo dough the same thing? No they are two different types of dough. Making puff pastry is a ton of work! I purchase it at the store, you’ll find it in the frozen food section. 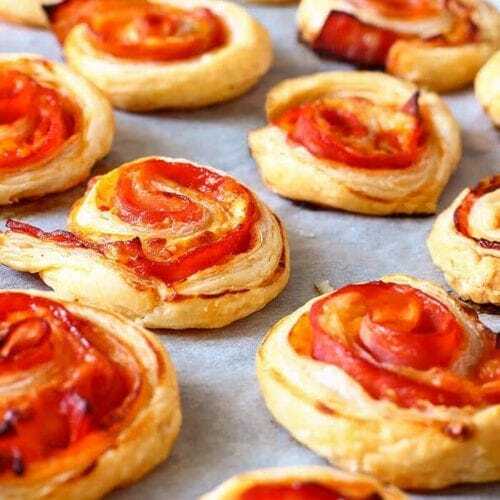 Puff Pastry Pinwheels - Easy and Fast Puff Pastry Appetizer with Bacon and Cheese! 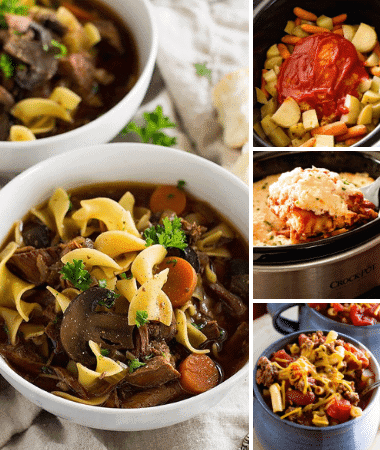 Perfect for Parties and Family Gatherings! The recipe looks really good. Just wanted to double check. 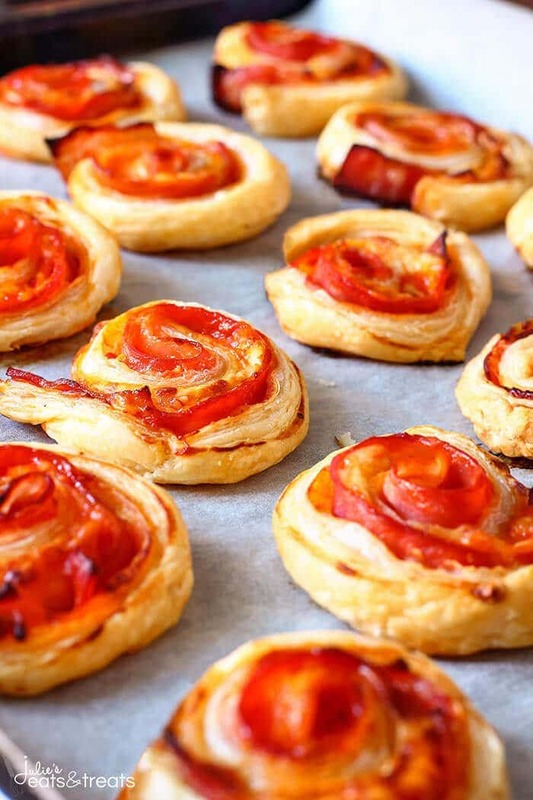 Is the bacon cooked before going in the puff pastry? Thank you! The bacon is uncooked. It will cook in the oven. 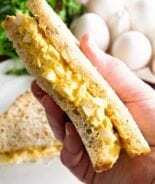 Just make sure using thin slices. Hope you’ll like them! 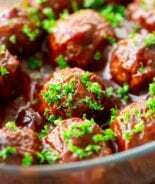 I am so loving this recipe! What a fun creative & fast breakfast I can make in the mornings. I think that is totally acceptable!